Explore LIBERTY Art Fabrics & Fashion exhibition at this special evening viewing with the Smart Textiles team at Edinburgh Napier University. Lace is not only a fashion fabric but also a touchstone for tradition, from christening gowns to mourning veils. The subject of a major exhibition at Bath’s Fashion Museum in 2018, lace is now the focus of 21st century innovation as the chosen material with which to advance large scale commercial manufacture of smart textiles in Scotland. Join Sarah Taylor, from Edinburgh Napier University to discover the latest developments in light-emitting textiles that combine optical and digital technologies. 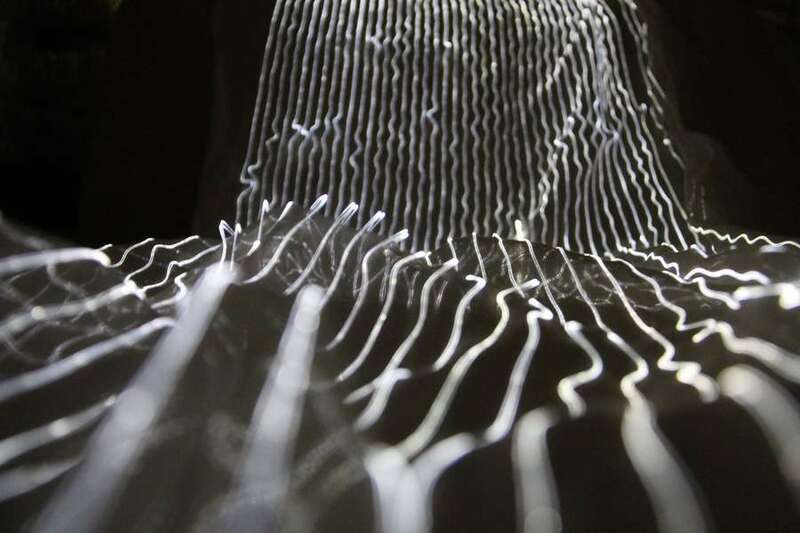 Sarah Taylor is a design practitioner and Senior Research Fellow at Edinburgh Napier University who has conducted pioneering research into the application of fibre optics within woven textile structures. She has worked in the field of e-textiles for over 20 years, specialising in light-emitting textiles. Her collaborative work is in public collections including including Aberdeen Art Gallery, the National Museum of Scotland and the V&A Museum of Design, Dundee. is a design practitioner and Senior Research Fellow at Edinburgh Napier University who has conducted pioneering research into the application of fibre optics within woven textile structures. She has worked in the field of e-textiles for over 20 years, specialising in light-emitting textiles. Her designs are in public collections including the National Maritime Museum and National Museums Scotland.